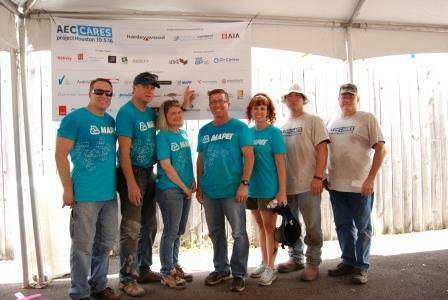 Left to right, MAPEI’s Steven Day (Operational Marketing Director), Mike Granatowski (Architectural & Commercial Projects Director), Jennifer Kramer (Communications & PR Manager), Sean Leich (Architectural Representative), Victoria Hearn, James Bissler (Sales Representative), and Scott Page (Business Development Leader) took part in AEC Cares ProjectHouston on October 5, 2018. On October 5, MAPEI partnered with the charity organization AEC Cares for “ProjectHouston,” donating time and materials in order to help improve conditions at Santa Maria Hostel in Spring Branch, which is a neighborhood of Houston, Texas. Santa Maria Hostel is a residential addiction treatment and housing facility that is home to approximately 100 women and their children. Founded in 2011, AEC Cares is a 501(c)(3) non-profit organization composed of architects, engineers and contractors, as well as manufacturers’ representatives who assemble teams of professionals, once a year, from the United States to donate time and products in order to renovate an at-risk facility. For more information, visit www.aeccares.com.